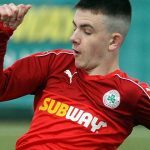 Cliftonville’s pre-season programme got off to an inauspicious start in this evening’s 4-1 defeat to Derry City. 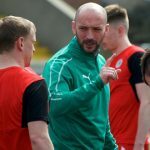 Rewarded for an enthusiastic start when Jay Donnelly opened the scoring, the Reds’ control of proceedings waned from the moment Aaron Spillane drew the visitors level from the penalty spot. Dean Shiels made it 2-1 before half-time, with Alister Roy and substitute Ronan Hale netting after the interval on a night that saw Cliftonville give game-time to 17 players. Led out by Ryan Catney, making his first appearance since January 2017, the hosts threatened through Joe Gormley and Garry Breen early on before Donnelly opened the scoring when he stroked into an empty net after getting the better of goalkeeper Eric Grimes in the air. Elder brother Rory Donnelly was next to test his luck before Conor McMenamin sent an effort whistling inches past the post from distance. Derry levelled matters on 16 minutes with their first serious forward foray; Spillane scoring from the spot after Roy had been tripped by Garry Breen. Shiels put the visitors in front just past the half hour when he beat goalkeeper Brian Neeson in a race to a smart ball in behind and, after losing goalscorer Donnelly to injury, the Reds came within a whisker of equalising when Catney’s dinked effort dropped just wide. Following a raft of half-time changes, the lively Ryan Curran went close to netting before Gormley miscued following good work from McMenamin in the buld-up, but it was City who would net next when Roy’s low drive beat Declan Dunne via the base of the post. 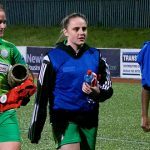 Cliftonville should have had a penalty when goalkeeper Grimes’ foul on Gormley inexplicably ended with referee Tony Clarke awarding the Candystripes a free-kick before Derry wrapped up their win when Hale seized upon a loose ball at the back to make it 4-1. The Reds woule endure further frustration in the closing stages when Damien McNulty – a half-time introduction for Breen – became the second home player of the night to leave the action early through injury. 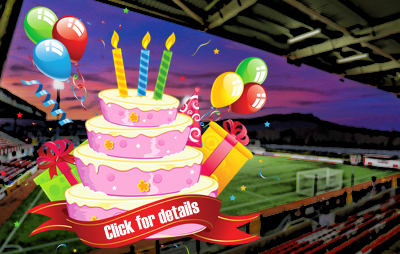 Cliftonville: Neeson, McGovern, Ives, Breen, Harney, R Curran, R Donnelly, Catney, Gormley, J Donnelly, McMenamin. Subs: Dunne (for Neeson, 46 mins), McDonald (for Catney, 46 mins), Lavery (for J Donnelly, 42 mins), A Donnelly (for Harney, 46 mins), McNulty (for Breen, 46 mins), Trialist A (for McMenamin, 66 mins), Breen (for McNulty, 85 mins).